Basic Information: What is FlexNow? 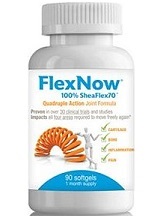 We take a look at the FlexNow Joint Formula product and determine its effectiveness in relieving joint and muscle pains. This product is comprised of 100% herbal ingredients that focus on alleviating joint and muscle pains, cartilage deterioration and inflammation. It also claims to be clinically proven to be safe with no risk of side effects. Read our complete review below to learn more about this pain relief product. This product contains only one primary ingredient which is the shea tripertenes. This compound is taken from the pit of shea fruit. The extracts of this fruit is known to have powerful anti-inflammation properties and helps build up joint muscles back to full health. These tripertenes are well known in the medicinal world when it comes to relieving joint pains and is now concentrated into a single capsule with FlexNow for optimum results. It is recommended to take three FlexNow soft gels a day. You can take it throughout the day with or without any food if you wish as it is perfectly safe. However, the preferred intake would be to drink all three capsules in the morning during breakfast. As always, you must follow the recommended daily dosage to prevent any form of complications. While this product is relatively safe to use and form of excess is bad for the health. You can purchase this product from online retail stores or through their official website. Purchasing directly from them is recommended as they offer two 90 soft gel bottles at a discounted rate of $51.25. This is enough for a two month’s worth of supply. After researching online for any cases of side effects caused by FlexNow we can honestly say that this is definitely one of the safest joint and muscle pain relief products in the market. Due to its 100% herbal ingredients, it has become a well-known safe medication for inflammation problems. This product has a 100% money back guarantee that you can take advantage of if you find this product ineffective with your case or does not meet your satisfaction when it comes to relieving muscle and joint pain. You can check their official website for more information about this policy and inquire with their customer support representative for more detailed information about the guarantee attached to this product. Overall, the FlexNow Joint Formula is a reliable medication for those suffering from pains on their joints as this contains highly powerful anti-inflammatory qualities. The price tag is also quite reasonable for a two month supply package and the inclusion of a guarantee will further keep your mind at rest in the instance that it does not give you the results you were looking for. However, looking at the track record of FlexNow it might be safe to say that this will deliver the goods and give you the joint and muscle support you are looking for.